Rogue One is arguably the film Star Wars fans have always wanted and, up until now, haven’t gotten. Spoilers follow in my review! Normally, I like to write around films without revealing too much in the way of plot. However, I feel Rogue One – by its nature as a film that breaks the Star Wars lineage as a standalone outing – deserves a concurrent break in tradition. Hence, I’ll be diving in deep with plot spoilers in this review. If you haven’t seen the film yet, head out, watch it, and then return here! As you might have read before you saw the film, Rogue One only has one of these things; gone is the standard opening crawl and in its place is a swift departure into the inky blackness of space. A typically Star Wars opening shot follows, with Director Orson Krennic’s shuttle plucking the rings of a Saturn-like planet like malevolent fingers shifting across a harp. If anything, I believe this is more metaphorical of Gareth Edwards’ directing style than anything else. After close to forty years of Star Wars, audiences have developed a set of seasoned expectations for a Star Wars movie; there’s overlapping demand for spectacle and subtlety that many would argue we haven’t seen so well expressed since The Empire Strikes Back. Edwards hence knows the notes he has to play to tell a story, and Rogue One possibly captures one of the most vibrant untold chapters of the Star Wars saga yet in a film that has a modern handle on proceedings. It’s a powerful film that every Star Wars fan should watch and would no doubt enjoy, but it’s a story that sacrifices subtlety for bombast. Let’s rewind the tape. Where previous Star Wars films launched audiences into proceedings with an opening crawl to at least provide premise and prologue as to the events about to unfold, Rogue One doesn’t enjoy that luxury – audiences instead have to rely on their wits and knowledge to piece together their understanding of the universe. While A New Hope – arguably one of the most influential films of all time – is the perfect canvas for this, there’s a certain loftiness in presuming that fans will be able to swing in line with the story as soon as the beat begins. Let’s be clear; I love Rogue One‘s opening sequence. In a stroke, we’re given the sweeping space spectacle we want, we’re introduced to our heroes and villains, and there’s a polite touch of Fathers and Sons – now Fathers and Daughters – that epitomizes the tale of Luke Skywalker and Darth Vader. However, the first act of the film doesn’t stand on its on legs, and is a jumpy, blurring cut of sequences that cobble together a story that would normally be surmised in the first few paragraphs of an opening crawl. Before heading in to see Rogue One, I predicted that we’d see Jyn Erso’s opening moments with her father, Galen, before fast forwarding to her release from capture by Rebel Captain Cassian Andor and K2SO. Instead, we’re treated to a smattering of appetizers of our cast before we’re granted the knowledge that each of these characters will come together in a meaningful way. No one suffers more in this equation than Forest Whitaker’s Saw Gerrera. While fans of The Clone Wars will be familiar with Gerrera’s character, new audiences are given hearsay and a pained exchange with Jyn to piece together his character all before he’s wiped out by the Death Star. It’s a sad waste of a character who could ultimately have lived to further extend his plot to the events on Scarif. While the rest of Rogue One‘s extended cast are given more opportunity to shine – and they do – the first act’s shifts see us unable to concentrate on a single character. We’re introduced to Bodhi Rook earlier than most other characters, and while Rook is central to the plot the anxious nature of the character only adds to an early tension that could have otherwise been eased. It doesn’t help that Rook is swiftly exposed to a monster of the same caliber of the Rathtars in The Force Awakens, which we could probably have done without for similar reasons. While Jiang Wen’s Baze Malbus takes a while to develop, Donnie Yen’s Chirrut Imwe is quick to grow on audiences as the closest thing we have to an Obi-Wan Kenobi presence. Both these characters, I feel, are given more opportunity to blossom as they’re introduced in a far more linear manner. Cassian Andor and K2SO are similarly benefitted by this approach, and I loved the shades of gray that Cassian’s introduction gave; proof that the Rebellion, while having a noble goal in the Star Wars galaxy, might not always take the noble route to achieve their vision. K2SO, in many ways, is more than comic relief; the character itself is the vociferous reminder that the same people who might have believed in the initial (percieved, in-universe) goals of the Empire now contribute to the Rebellion – and that darkened tone translates well. In our protagonist and antagonist, there’s something new. Felicity Jones brings with a new edge as Jyn Erso; one less naive than the Skywalkers and altogether less altruistic. While Jyn joins the fight for her own goal of freedom, then meeting her father, and then fulfilling his final wish, her translation from cog-in-the-wheel to heroine are a new element to Star Wars; a murky parallel to Han Solo, without the plot armour that guaranteed Harrison Ford’s character would last until The Force Awakens. Ben Mendelsohn’s Orson Krennic is altogether a new component for the Star Wars universe, and one at that which sheds more light on Imperial political subterfuge than anything else; as hinted by Krennic’s less articulate accent, the character is one that has climbed from nothing to someone and desperately attempts to not only hold onto his position, but further his lot in life as well. The visage of death that surrounds the character – whether from his Death Trooper bodyguard to his personal shuttle – is a unique knife in the side of an Empire that has typically been portrayed as rigidly militaristic and without identity. With these characters in tow, the film’s second and third acts begin to form a far more cohesive narrative which cements itself during the assault on Eadu. With motivations and the plot underway, the film focusses less on shifting through events and begins – finally – to focus on telling them. The exhausting chop-and-change of the first act ends, and so begins an exhausting emotional avalanche that crescendos into a somber tale, but one not without hope. Arguably the first Star Wars film to tell a story centered around an ensemble cast that function in the same context, Rogue One goes from strength to strength when its constituents have something to lose. That’s altogether supplemented by the fact that the Empire has its own ensemble as well. The return of Peter Cushing’s Grand Moff Tarkin is a technical marvel, but is likely one that will have you actively seeking to explore the physical differences between the actor’s real visage and the one manufactured on-screen. Never the less, what makes the character a convincing endeavor isn’t so much the fact that Peter Cushing’s face returns, but that Guy Henry – no matter how visible he may be under the surface – captures Cushing’s body language and crisp, articulate diction – something that bounces well off the shorter and inarticulate Krennic. Of course, speaking of height and articulation, one can’t ignore the return of James Earl Jones as the voice of Darth Vader. While I’ve personally found Jones’ work on season two of Star Wars Rebels to be far below his usual performing standard, the same Vader we saw in A New Hope, Empire, and Jedi returns with aplomb – if not more so – in Rogue One. There is the matter to debate who Vader’s chamberlain is – the mysterious character we glimpse for a few seconds as the charred remains of Vader’s body is absorbed in a bacta tank – but there’s something undeniably satisfying about not only seeing the character at its best, but simultaneously at his most ruthless yet. The heavy-hitting lineup of villains is something that propels Rogue One into its latter half; the stakes are desperate, and hope – the continual motif of the film – is all that powers Jyn and her rag-tag assortment of rebels through a rousing speech on Yavin IV and finally Scarif. The build-up to those final movements is both dexterous and deliberate; the Rebels assemble together and utilise their best strengths to fight their way through one of the Empire’s most fortified locations, all before beginning an all-out struggle that’s one of the best engagements on the ground and in the sky since Return of the Jedi. The return of ancillary Rebel characters during the film’s orbital climax is a thrilling one to live through, and nods to other canon material (such as the Hammerhead cruiser and a ship which closely resembles the Ghost from Star Wars Rebels) keeps one on their toes. Things are at their darkest in Rogue One as the cast begins to die, and the deaths of K2S0, Chirrut Imwe, and Baze Malbus are heartbreaking in their own, quiet way; deaths are dwelled upon, reinforcing to viewers that for the Rebellion, this assault means victory or death. 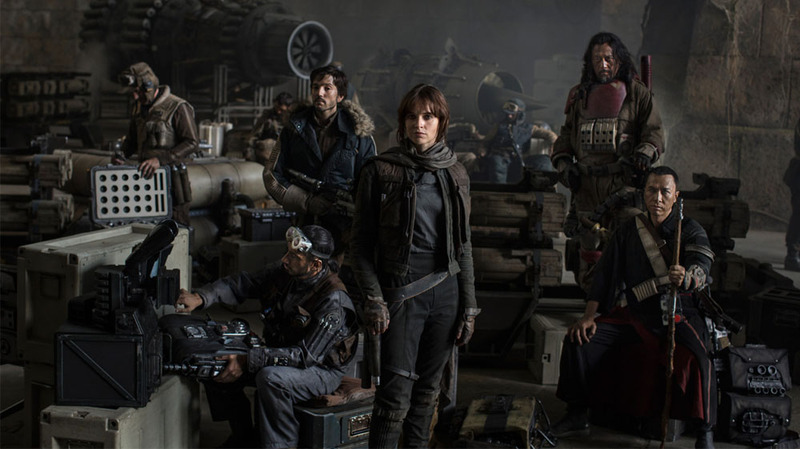 The tenacity of the team in their final moments – as Bodhi is caught in an explosion – sees the film stagger and shake before Jyn secures the transmission that beams the Death Star plans off-world. Before we see the end of Jyn and Cassian, we see the demise of Krennic – one at the hand of the very weapon he strove to create. Ultimately, the fact that Krennic isn’t so much killed as a result of his ambition, but rather at the hands of his success, is a peculiar notion when it has been reinforced that throughout the Star Wars saga that a villain’s worst qualities will be their ultimate undoing. Similarly, Jyn and Cassian’s deaths are an oddly reflective event; fate swallows them over as the Death Star fires a preliminary blast on Scarif’s surface, while in high orbit the Rebellion prepares to swiftly evacuate the planet. A highlight of the film – and a tease to the movie that began the entire saga – takes place as Vader brutally carves his way through Rebel troops as soldiers exchange the Death Star plans in a deadly baton race. The cries audible in the scene – ‘help us!‘ – are a brutal, ruthless and unnerving reminder of the evil the heroes of the original Star Wars saga go on to face; one that is arguably necessary after Vader was neutered during the prequel trilogy. The film ends with Princess Leia – another product of CGI reprisal, similar to Peter Cushing’s Grand Moff Tarkin – in a scene that launches the film into its sequel, A New Hope. If anything, this was a disappointing notion as the work done to recapture Carrie Fisher’s iconic appearance in A New Hope falls desperately flat. As die-hard Star Wars fans will be well aware of, one of the key choices George Lucas made while directing A New Hope (then Star Wars) was the use of John Williams’ classical score over the synthesized pop that dominated the latter half of the 70s. The result of Williams’ music was a masterclass in subtlety, humour, tragedy, and suspense; a smorgasbord of sound that rolled together to form not just a sonic terrain, but a landscape of valleys and mountains. 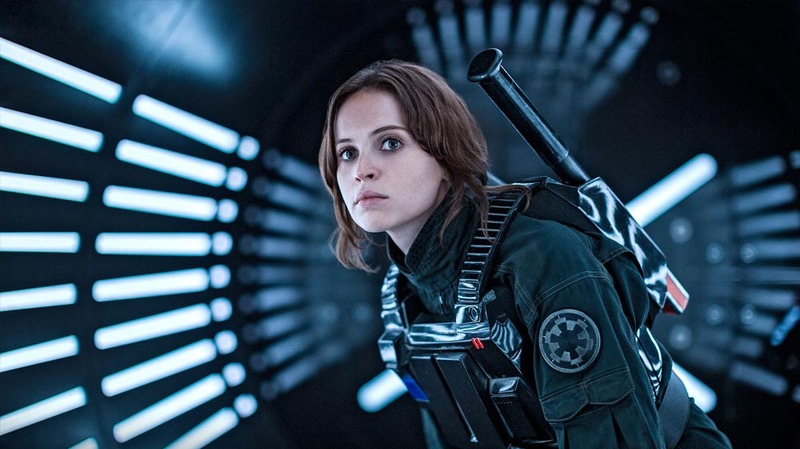 Rogue One is the first live-action film without a Williams’ score in tow, and the film’s plot can be well characterized by Michael Giacchino’s score; bombastic. While a beautiful motif was shown in many of Rouge One’s trailers – encapsulating Darth Vader’s theme with Binary Sunset, there’s one of the same delicate touch here; Rogue One is loud and overly punctuated by its music rather than using its soundtrack as an expression of emotion and identity. I’d argue, of all the film’s shortcomings, that is largest is the fact you’d have emerged from the cinema without a closing reprise ringing in your head beyond, of course, John Williams’ credits score. In closing, I thoroughly enjoyed Rogue One. A well-formed cast of compelling characters – stronger due to a diversity of ethnicity and identity than ever – craft an enjoyable and aggressive take on the Star Wars formula. The epic space opera tone that introduced many audiences to science fiction and reshaped the movie industry is back, and Gareth Edwards has succeeded in developing not only the most modern Star Wars film yet, but further one that is intricately connected with the saga’s humble roots. Rogue One is a film that does without an opening crawl, John Williams score, or even a conventional Star Wars structure. There are sacrifices that have been made, and this is a film that is utterly unique in the saga for its dark political and militaristic tone. The joyful naivete, mysticism, and camaraderie that birthed Star Wars in the late 1970s has been replaced by something that many living in 2016 – particularly millennials – might associate with; a darker time, a harder world, but not one without hope. In a difficult year, Rogue One in many ways epitomizes the culture and class of the world it finds itself birthed from, and serves as a better reminder for the film industry – and beyond – that while times may seem desperate and dark, hope still remains. Follow me on Twitter (@bryansmithSA) and let me know your thoughts on Rogue One!